Heat oven to 350°F. In 10-inch skillet, cook chorizo 8 to10 minutes or until thoroughly cooked, stirring occasionally. Meanwhile, microwave frozen potatoes for 5 minutes as directed on bag. Remove from bag and coarsely chop potatoes. Stir into chorizo. Keep warm. Meanwhile, separate each biscuit into 2 layers. Press each layer into 4-inch round. Place on large ungreased cookie sheets. Bake 9 to 11 minutes or until light golden brown, rotating cookie sheets after 5 minutes. Meanwhile, in food processor, place tomatillos, avocados, 1/2 cup of the cilantro, 1 teaspoon salt and 1 teaspoon pepper. Cover; process 20 to 30 seconds or until smooth. 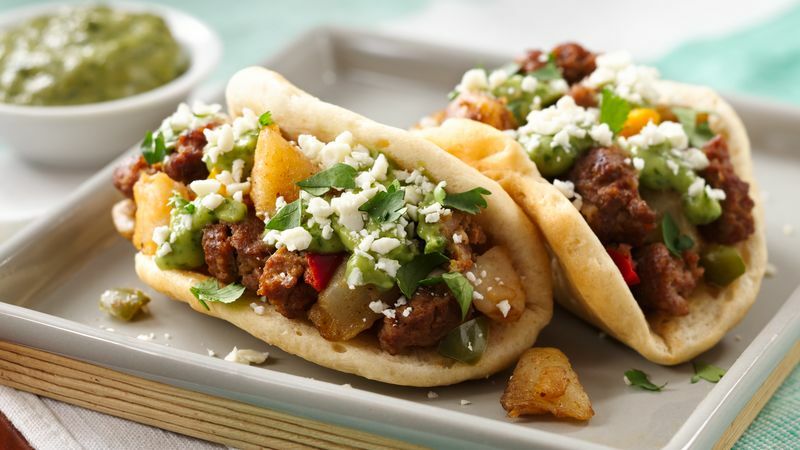 To assemble tacos, gently fold each biscuit in half. Fill each with 1/4 cup chorizo mixture and 2 tablespoons salsa. Sprinkle with cheese and remaining cilantro.